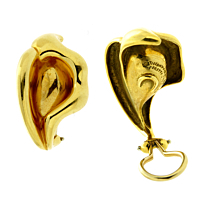 These teardrop shaped Calla Lily gold earrings from Tiffany & Co are both understated and elegant. The setting is three dimensional to resemble to beautiful flower. Set upside down, the Calla Lily earrings curve gracefully downward, with a substantial open loop clip on clasp in the back.